Now it its 11th year of operation, Brooklyn Preparatory High School is one of ISA’s most mature schools. The school currently serves 489 students and boasts an 83% graduation rate, which is 15% higher than both the city and borough average. Throughout the four years a student attends Brooklyn Prep, educators teach the habits of mind (thinking and communicating with clarity and precision, gathering data through the senses, striving for accuracy, etc.) and habits of work (organization, perseverance, eagerness, etc.) and reiterate their importance in students’ road to success. These qualities and skills, when combined with exposure to diverse opportunities, help prepare students for college and career experiences. Brooklyn Prep students practice these qualities during an extensive, school-wide portfolio assessment and extracurricular activities. Extracurricular activities allow students to experience the world outside the classroom and get a taste of what life after high school may entail. Through various organizational partnerships and volunteering programs, students explore their interests and get experience prior to their college education. PENCIL, a NY nonprofit that fosters collaboration between business and public schools, helped spearhead Brooklyn Prep’s partnership with the Holland & Knight Law firm in Manhattan called the Young Lawyers Club. Approximately 30 juniors and seniors who are enrolled in Advanced Placement U.S. History make monthly visits to the Manhattan offices of Holland & Knight to discuss current and historic events they are learning about in class, and their respective legal ramifications, with experienced attorneys. During their last visit on March 11, 2015, the club learned about the NYC Affordable Housing Policy, wrote their arguments for or against the policy, and then presented them to their peers and Holland & Knight mentors. Brooklyn Prep also works with another nonprofit called Junior Achievement of New York (JA New York) to coordinate additional volunteering opportunities, like the High School Heroes program which trains Brooklyn Prep students to teach entire classes of elementary school students for a whole school day. JA New York also connected Brooklyn Prep with Digitas, a graphic design firm. 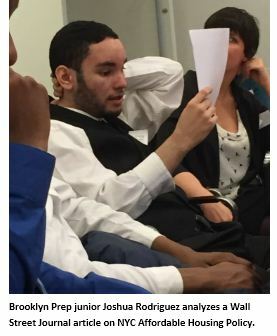 It provides volunteers that mentor Brooklyn Prep students competing in the annual JA New York Business Plan Competition, in which students compete for a $2,500 reward by designing a business plan that gets judged by successful entrepreneurs. Additionally, Brooklyn Prep’s participation in the Youth and Philanthropy Initiative (YPI) allows participating sophomores to research a charity and create a presentation advocating for a $5,000 grant on the charity’s behalf. The best presentation then wins the $5,000 grant for a charity. Brooklyn Prep also gives students the chance to job shadow, complete community service, earn college credit, and participate in internships – all of which contribute to the students’ ability to hone their habits of mind and work prior to embarking on post-secondary and/or career journeys.